David Moyes has three years left on his Sunderland deal, but is he the man to bring the club back to the top flight? 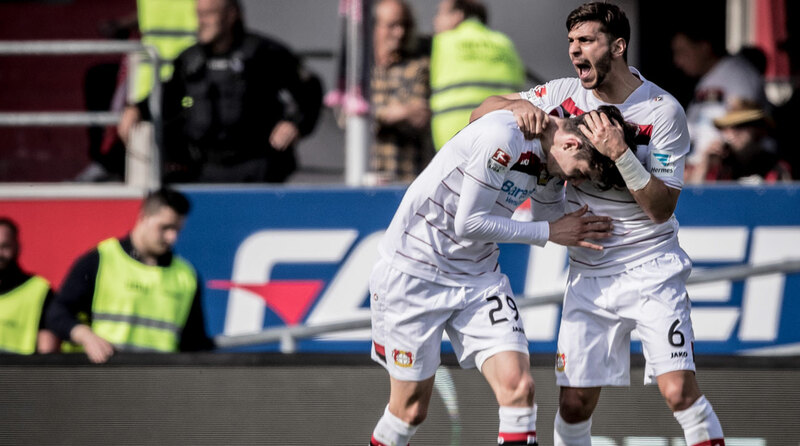 It took a goal from a 17-year-old to net a valuable point for Bayer Leverkusen in its improbable relegation scrap. 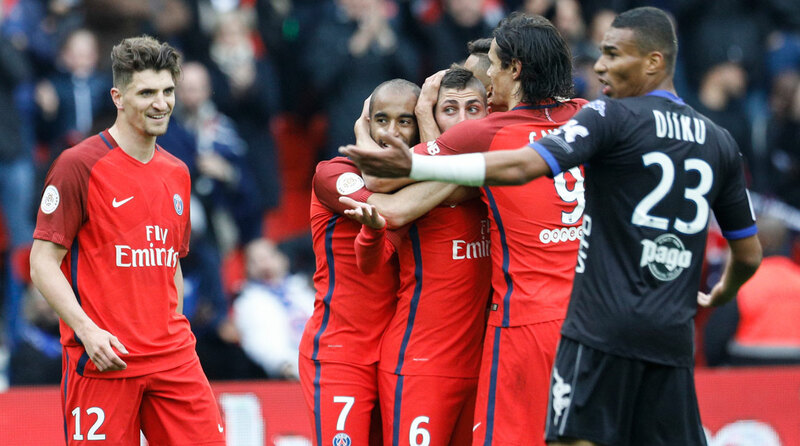 Marco Verratti tested the bounds of gamesmanship in PSG's rout of Bastia. The seasons around Europe are winding down, and the title pictures are clear across the five major leagues (not to mention the anticlimactic Champions League semifinals), but there were still plenty of talking points to come out of another dramatic weekend of action across the continent. Already-relegated Sunderland did its best to have Hull City join the ride to the second tier, though doubts remain surrounding the future of Black Cats' boss David Moyes. In La Liga, Lionel Messi powered Barcelona, but Real Madrid matched its rival and continues its challenge for a league and Champions League double with a comfortable win over Granada spearheaded by its depth. In the Bundesliga, Bayer Leverkusen needed a 17-year-old to get out of trouble, while in Serie A, Roma coach Luciano Spalletti was under fire in his latest clash with the retiring Francesco Totti. In Ligue 1, Monaco inched closer to the title, while PSG was back to winning ways–but not without some controversy along the way. 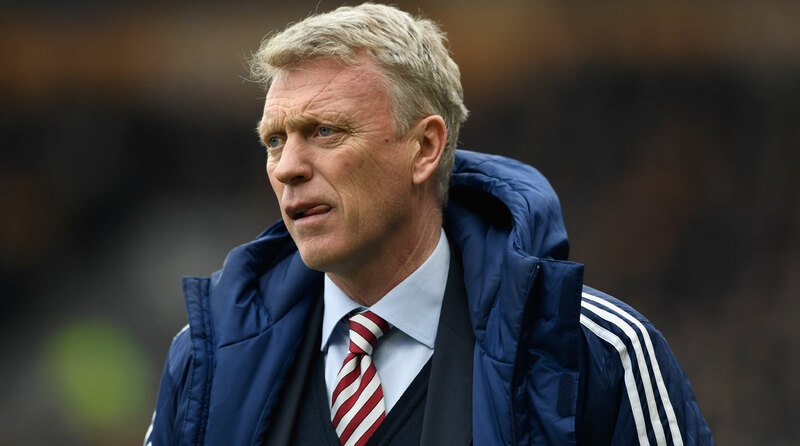 PREMIER LEAGUE: Is Moyes the manager for Sunderland's future? After enduring relegation, is David Moyes the manager to lead Sunderland back? One week after confirming its relegation from the Premier League, Sunderland went and did something it has only done before twice all season–it won away from home. That it did so against Hull City, fighting relegation and with a coach, Marco Silva, whose sides have been unbeaten at home for the three years he has been a head coach, was all the more surprising. Sunderland coach Davd Moyes is one year into a four-year contract and is trying to keep his job. Moyes’s messaging has been peculiar all season. After the second match of the season, a loss to Middlesbrough, Moyes declared the team was in a relegation battle. Only 10 matches ago, the team was just two points away from safety; since then it has capitulated, picking up two points in its last 10 games before the Hull win. Too little, too late. Sunderland has changed coaches in each of the last five campaigns mid-season, but it did not do so this season. The club spent £30 million on new players last summer, and more in January; seven of those are players with whom Moyes had worked with before: Joleon Lescott, Darron Gibson, Bryan Oviedo, Victor Anichebe, Donald Love and Patrick McNair. None can be said to have been a success. This relegation was not inevitable, as Moyes has painted it. It could have been avoided. And now Moyes wants to be the man to get Sunderland back into the top-flight. “I want to be able to have a team which would come straight back up,” he said. The team is likely to be without its two key performers of this season: goalkeeper Jordan Pickford, outstanding against Hull and wanted by up to five Premier League teams this summer, and Jermain Defoe, allowed to leave this summer and already wanted by Crystal Palace, West Ham and Bournemouth. He could do a job as an impact sub at a team higher up the table, too. Sunderland has three players on loan going back to their clubs and 1- players out of contract this summer. There will be an overhaul on the playing side. The question for owner Ellis Short is whether he wants Moyes to be in charge of that. Real Madrid edged ever closer to making history this weekend. It’s still a surprise that for all the records he has achieved at the Santiago Bernabeu, the 399 goals, three Ballon D’Ors and two Champions League titles, that Cristiano Ronaldo has only ever won La Liga once in the last eight years. That might change this season as Real Madrid, with its valuable game in hand (vs. Celta Vigo, which was finally rescheduled for May 17), kept pace with Barcelona with a 4-0 win over already-relegated Granada. It could have been worse had the visitor not taken its foot off the gas after scoring all four goals in the first half. Coach Zinedine Zidande could afford to rest nine players from the midweek Champions League win over Atletico Madrid, and once again his nominal "B Team" did not let him down. James Rodriguez and Alvaro Morata both scored twice, and this heavily-rotated second squad has won its last five games. Real Madrid’s stature in La Liga is partly down to having such a deep squad. Whether the two scorers have been happy enough with their opportunities to stay at the club beyond the summer remains to be seen, as there will be no shortage of offers for them. The same looked true of Isco earlier in the year, but since Gareth Bale’s latest injury, the Spaniard has been playing superbly as a No. 10 behind a Ronaldo-Karim Benzema strike force. It’s a sign of his evolution that he was also rested for the Granada game. Zidane took him off after an hour of the Atletico semifinal as he was on a yellow card and he did not want to risk a red. 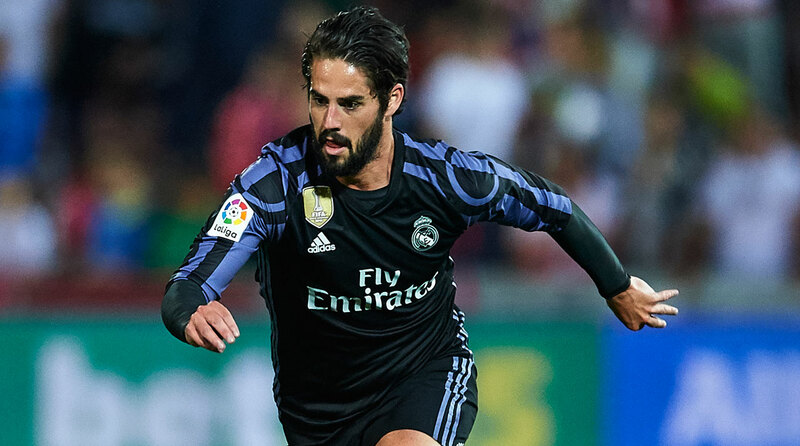 Isco has the ninth most appearances in the squad, and with nine goals, is the sixth-highest scorer behind Ronaldo, Benzema, Morata, James and Sergio Ramos. Real Madrid has noted his improvement and, after extending the deals of all its top players, wants to push his deal beyond the current expiration of 2018. It has offered him the chance to be among the best-paid in the squad, but Isco wants guarantees of game time. That’s something he could get at almost all the clubs linked with him–the likes of Manchester City, Chelsea, Arsenal, Juventus and even Barcelona–but can Madrid promise that? If not, one of Madrid’s elite rivals will take the chance to build its team around a top talent. One week after Bayern Munich clinched the Bundesliga title, RB Leipzig sealed second place and Borussia Dortmund leap-frogged Hoffenheim after beating it 2-1 in a tense home encounter. The real intrigue in the league now remains at the bottom, where Bayer Leverkusen, which began the campaign the Champions League, is still not safe from the drop after a 1-1 draw with relegation rival Ingolstadt. Leverkusen sporting director Rudi Voller hardly calmed the nerves at the club before the match, declaring “our existence is at stake” as it bids to avoid a spot in the relegation playoff place. Since replacing Roger Schmidt in March, new coach Tayfun Korkut had picked up six points from eight games. Last week, after a 4-1 home loss to Schalke, the players went to the fans after the game to apologize. Leverkusen was heading for defeat when Sonny Kittel put Ingolstadt ahead with 15 minutes left to play. Then up popped the only bright spot of Leverkusen’s season: 17-year-old Kai Havertz, to head home Wendell’s corner from close range. It earned a point that could be enormous in the race for survival. “Schoolboy saves Leverkusen's millionaires!” wrote Bild. Leverkusen may have been without Jonathan Tah, Javier Hernandez and the injured Omer Toprak and Julian Brandt, and Hakan Calhanoglu (serving a FIFA-imposed four-month ban for breach of contract), but this is a side that is still woefully under-performing. The question for Voller is how to approach the summer market once this "cursed" season (as he puts it) ends. Will it hold onto its young stars like Tah and Brandt, who this week told Focus that he wanted to stay at the club next season so he could earn a spot in Germany’s World Cup squad? Who will replace Korkut on the bench, as his position looks increasingly untenable? There will be big changes this summer, but with the likes of Havertz and Brandt at the club, the future can still be bright; as long as Voller gets the big calls right in the coming months. What is the best way to say goodbye? 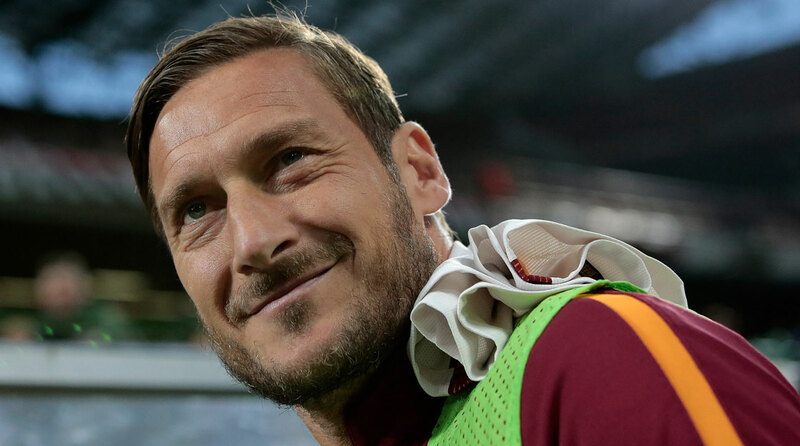 In an ideal world, Roma would be in a cup final and its talismanic captain, Francesco Totti, would score the winning penalty to put the cap on a career that has spanned 25 years and seen him win one Scudetto (2001) and two Coppa Italia titles (2007, 2008). Reality does not work like that, though. Last week, Roma’s new sporting director Monchi confirmed that Totti would retire as a player in a few weeks. And so the farewell begins, with even opposition fans paying their respects. At the San Siro, Sunday night, Milan fans unfurled a banner which read, “The Curva Sud pays tribute to our rival Francesco Totti”. With Roma winning 4-1, some hoped that Totti would come on for his last appearance at one of Italy’s most storied arenas. It was not to be: with the result in doubt before Roma sealed it late on, manager Luciano Spalletti bought on Bruno Peres as a sub instead. And so began a firestorm in which the coach was accused of disrespecting Totti. As it happened, Roma was awarded a late penalty which Daniele de Rossi scored; had Totti been on the pitch, he would have taken it. This was a record sixth consecutive away win for Roma, which is one point ahead of Napoli in second with three games left to play; the next is one against Juventus, when anything less than a win will secure another title for Juve. Spalletti is out of contract this summer, and simply cannot win either way on the Totti situation. After PSG as good as kissed goodbye to its Ligue 1 title chances with last week’s defeat at Nice, the capital club continued to keep the pressure on leader Monaco with a 5-0 win at Bastia. The result was never in doubt, but most notable was the second goal, 10 minutes before halftime. Bastia goalkeeper Jean-Louis Leca was checking on the injured Blaise Matuidi, lying just inside the pitch by his near post; Marco Verratti, spotting the keeper out of position, fired in a shot from 20 yards that cannoned in off the crossbar to put PSG 2-0 ahead. The confusion came because Lucas Moura had asked his teammates to halt play so Matuidi could receive treatment. Bastia had seen that and had stopped. Leca was furious when the goal was given–even though Julian Draxler was blocking him in an offside position –and was booked for his protests. “I’m a little upset, but that did not make us lose,” he told Canal Plus after the game. The result changes nothing at the top of Ligue 1: Monaco went to injury-ravaged Nancy and won 3-0 to remain on course for the title. Coach Leonardo Jardim only dropped one player, Kylian Mbappe, in between European semifinal legs against Juventus. “I would not swap a win here for a win against Juve next week,” he said. Winning Ligue 1 and reaching the last four in Europe is still quite a season by any standards for the club. 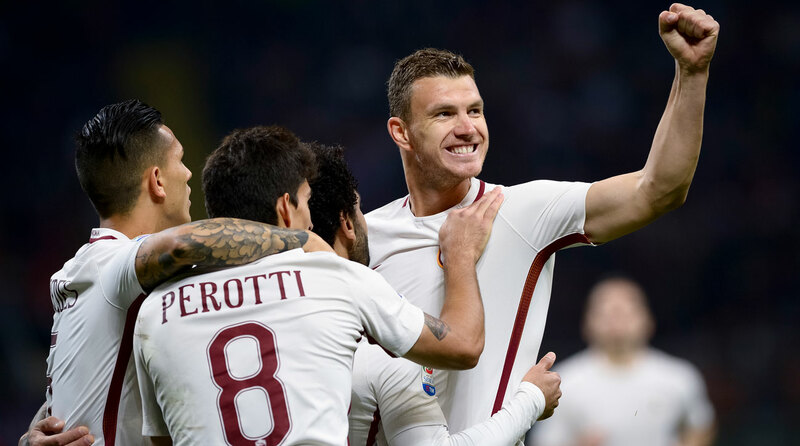 Edin Dzeko (Roma): The in-form Bosnian forward delivered a fantastic strike from the edge of the area vs. AC Milan. Adem Ljajic (Torino): It takes something special to beat Gigi Buffon from this sort of distance and Ljajic came up with the goods with this marvelous free kick in the Turin derby. Marco Verratti (PSG): Was it controversial? Yes. Was Julian Draxler offside and blocking the keeper? Yes. Still a brilliant strike from distance? Yes. Patrice Evra (Marseille): The defender scored his first Ligue 1 goal since March 2003 with a low diving header to convert Dmitri Payet’s cross for the winner against Nice. Kevin de Bruyne (Manchester City): Two assists and a goal for the City midfielder in the 5-0 win over Crystal Palace. The Belgian has not been on top form this season, but this was better. Anthony Modeste (FC Cologne): Two more goals for Modeste in the crazy 4-3 win over Werder Bremen takes him to 25 for the season. He even celebrated his second goal with a gentle embrace with Cologne’s goat mascot Hennes VIII.